1. Audition Sheet (Click here to download): Required for all in order to audition. For those under 18, the form must be signed by a parent/legal guardian. Blank audition sheets available at the door. 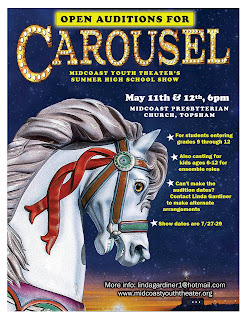 To the strains of the "Carousel Waltz" the curtain rises upon an amusement park in a New England town in 1873. Fishermen, sailors, mill girls and children are enjoying the sights and sounds of a carnival atmosphere. 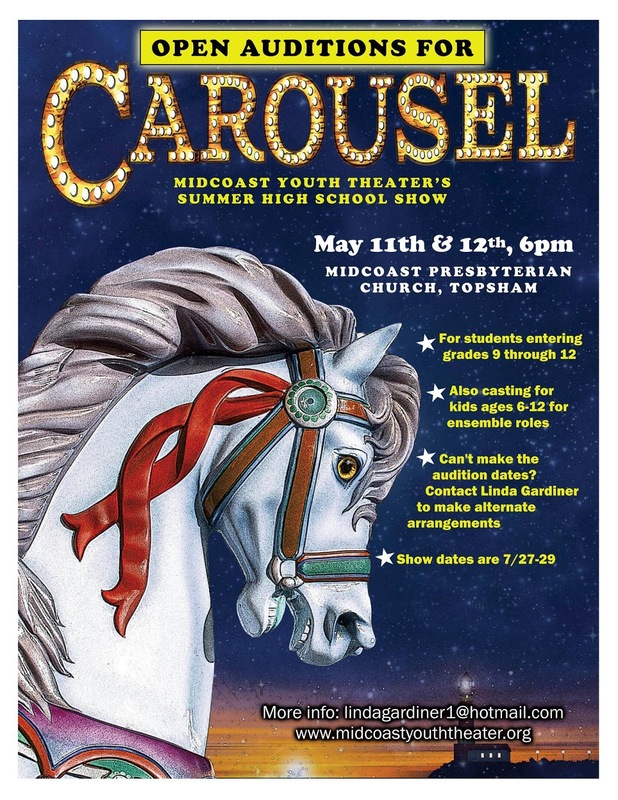 Two mill girls, Carrie Pipperidge and Julie Jordan, are having a good time until Mrs. Mullin, proprietress of the carousel, insults them. When her handsome, strapping barker, Billy Bigelow, jumps to the defense of the girls, Mrs. Mullin summarily fires him. Billy, being a happy-go-lucky fellow, does not take this dismissal to heart; on the contrary, he invites Julie to have a beer with him. While he is off to get his belongings, Carrie asks her friend Julie whether she finds Billy attractive, but Julie is singularly evasive ("You're a Queer One, Julie Jordan"). Carrie thereupon confides to Julie that she has a fellow of her own, the fisherman Enoch Snow, whom she plans to marry ("When I Marry Mr. Snow"). When Billy returns and is left alone with Julie they begin to talk about love, and the kind of person each would be attracted to. When Billy inquires if Julie could ever marry a person such as he is, Julie replies that she would--if she loved him ("If I Loved You"). The romance soon takes wing: Julie and Billy get married. Making preparations for the first clam-bake of the year, the fishermen, mill girls, sailors and children are ebullient over the vernal season ("June Is Bustin' Out All Over"). Carrie and Enoch Snow dream about their future together as man and wife ("When the Children Are Asleep"). At this point Billy learns that Julie is pregnant. Though up to now completely irresponsible and incapable of meeting the emotional and domestic demands made upon him by marriage, Billy is suddenly filled with a sense of parental pride and with an overwhelming feeling of tenderness for both his wife and his unborn child ("Soliloquy"). He is determined to get money for them to assure their future. The clam-bake proves a gay affair. ("This Was a Real Nice Clam Bake"), alive with good humour, rowdy spirits and song. Julie, however, is touched with sadness, knowing as she does that her husband is volatile in his moods and undependable in his behanviour; yet she loves him deeply, and for this reason there is no point in her wondering if he is good or bad ("What's the Use of Wond'rin'"). But that there is much bad in Billy becomes evident when he gets involved in a hold-up. Caught by the police, he commits suicide to elude arrest. Overwhelmed by her grief, Julie tries to find solace in the comforting words of her friend, Nettie ("You'll Never Walk Alone"). Billy arrives in Heaven, where he defiantly tells two of its police that he does not regret his actions on Earth. For this he is doomed to spend fifteen years in Purgatory. At the end of that period the Starkeeper in Heaven permits him to return to Earth for a single day to gain redemption for his soul. Snatching a star from the firmament, which he intends as a gift for his daughter, Billy comes back to Earth. He finds that she is an unhappy child who is incapable of receiving his gift. As a reflex action in his disappointment, Billy slaps her face, but the slap is given in love, and not in hate, and so the girl feels no pain. Through his understanding and tenderness, Billy is able to lift his daughter out of her misery and to fill her with hope and courage. He now watches the ceremony during which she is graduating from highschool, happy to see that her head is now high, happy too that he has found redemption. lively, funny friend and coworker of Julie Jordan. In love with Enoch Snow, Carrie offers a light-hearted balance to Julie's seriousness. Must be a strong singer and strong actor. Soprano D–G. a bumbling, adorably shy fisherman with big plans for the future. A successful and somewhat pompous business owner in the second act. Must be a strong singer and strong actor. Tenor B-A. Julie's older cousin. Soft-hearted, hearty coastal woman who owns and runs a seaside business. Nettie is Julie's strength throughout the show. Must be a strong singer and actor. Mezzo C–G. the dangerous, menacing seaman friend of Billy's who ultimately leads Billy astray. A con man with a bit of humor and an eye for Carrie Pipperidge. Must be a good singer and a strong actor. Baritone C-D.
widow and owner of the carousel. Jealously in love with Billy. strong actor .This role may double with the ensemble. this is a major dancing role. Louise dances the entire ballet in the second act. A non-singing role that requires acting ability. the very strict owner of the local textile mill where Julie, Carrie and the other girls work. This role will double with the ensemble. a heavenly figure. Dr. Seldon is the earthy version of the Starkeeper. This role may double with the ensemble. two angels sent to bring Billy to the Starkeeper after Billy's death. This role will double with the ensemble. the son of Enoch and Carrie, he appears in the second act. He likes Louise (Julie & Billy's daughter) but thinks she is beneath his station. This role will double with the ensemble. Extensive dancing and singing. all types and vocal ranges. Ensemble members will play townspeople, including: fair people, the girls from the mill, sea-faring men, policemen, ship captain, principal, etc. 9 children in ages that rage from 6 to 13, or who can look thoses ages. Can participate in all ensemble numbers.